Calistoga is a Californian restaurant in central Edinburgh which has had good reviews and I’d fancied trying it for a while. We decided at the last minute to go out to eat on a Saturday evening and started phoning around to find somewhere that wasn’t booked. Calistoga had tables free so we decided to go for it. It’s in a pretty grim location – in a lane at the back of Rose St, opposite some bins but the interior is fine, if a little dated. The menu looked interesting but, unfortunately, the food was rather disappointing. I started with clam and corn chowder, which was competently executed but nothing really to write home about. I followed this with a seafood platter – langoustine, prawns and two different kinds of deep fried fish. The langoustine was fine but, sadly, the fish was a bit overcooked and the chips as an accompaniment were a bit soggy. I couldn’t help but compare it with the seafood platter which I had in the Eagle Barge at Laggan Locks – the same price but so much fresher tasting and more interesting. My wife Anne had pork loin which was really quite tough – it looked well-enough cooked so I suspect it wasn’t the best quality meat. I wasn’t convinced by the glutinous rice accompaniment either. My pudding was rum and raisin parfait with a caramel sauce – which was excellent but Anne’s pannacotta had a bit too much gelatine and so was rather bouncy. The wine (Californian sauvignon blanc and Californian Muscat as a dessert wine) was very good as was the service. But, I don’t think that we’ll be back. We were about £38 each including wine and for that we could certainly have eaten better elsewhere. The Honours is a companion restaurant to Restaurant Martin Wishart in Leith – the best resto in Edinburgh I think. The Honours is more of a bistro with simpler food – cheaper but by no means cheap. We went there for my daughter’s birthday dinner. On a Wednesday evening, it was really buzzing with a great atmosphere. It’s quite dark inside – which my wife and daughters like – but I’d prefer a wee bit more light. No complaints about the food though – an interesting menu with a mix of unusual dishes, bistro standards such as rabbit with mustard and grills. 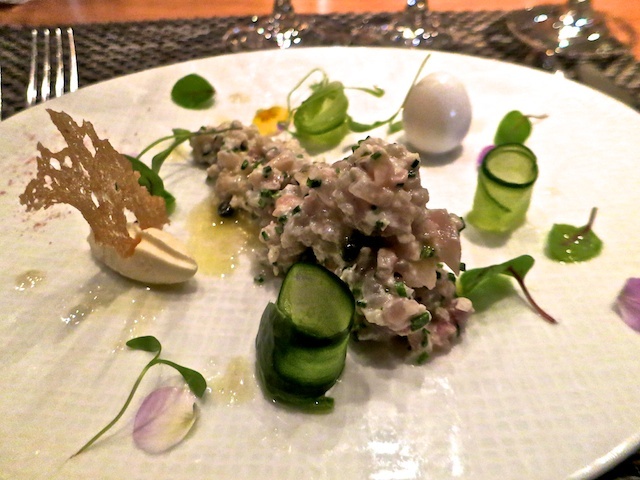 I started with sea bream tartare with pickled cucumber – fresh raw fish really is very good – and this was a fresh tasting dish with the cucumber providing an interesting contrast. 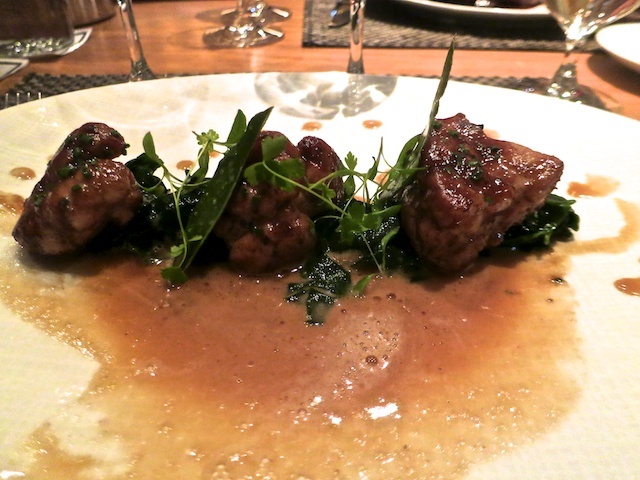 My main course was veal sweetbreads – which, for lots of people, means yuk! You don’t see them on menus very often and I think they are probably easy to mess up. But not here. These were melt-in-the mouth good. Absolutely fabulous and thoroughly recommended. The Honours as you would expect from Martin Wishart, the food in the Honours is top quality. It is not cheap – with wine it was about £45/head but probably as good as you’ll get for that price in Edinburgh. I’ve been to the Edinburgh Larder, a cafe in Blackfriars Street a couple of times and have always enjoyed the food. I’ve tried to go there more often and it’s a measure of its quality that it was always full. So, when the same people opened the Edinburgh Larder Bistro in what used to be Howie’s in a basement on Alva St as a bistro, I was keen to try it. I’ve now been there a couple of times – once for lunch and once for dinner and I really enjoyed the food. They focus on local ingredients from Scottish suppliers – but sometimes with a bit of a twist. Our most recent experience was a family birthday dinner – it was a Tuesday night so the resto wasn’t full but there were enough people there to create a good atmosphere. My starter was brioche with Stornoway black pudding and a quail’s egg – simple but the quality of ingredients meant it was very good indeed. 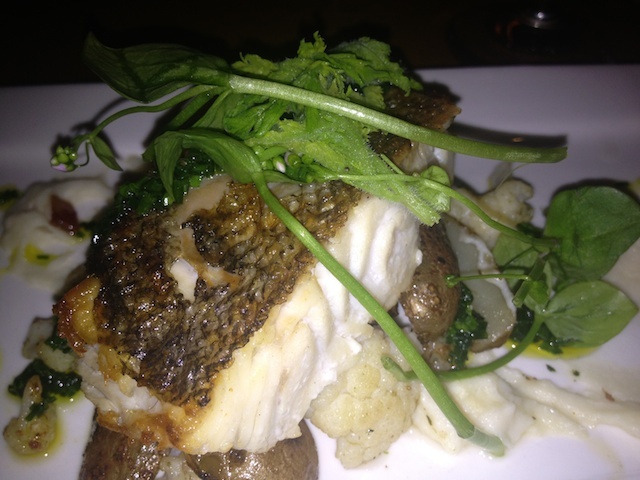 My main was home-smoked pollack, a previously unfashionable fish, with cauliflower and heritage potatoes. I enjoyed this but I thought the smoking was a wee bit unsubtle – but this may be my changing taste as I’ve recently come to prefer lightly smoked rather than heavily smoked dishes. 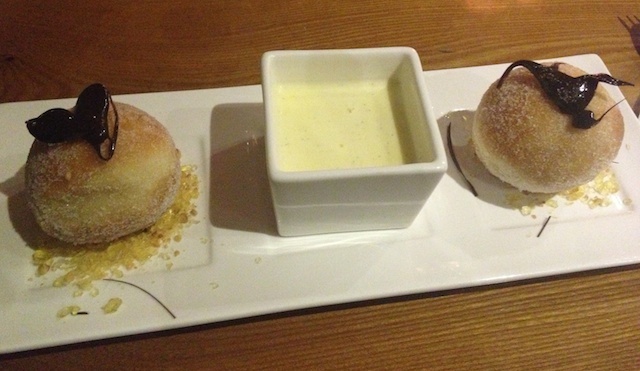 I don’t often eat desserts but I’d just finished a big walk across Scotland so needed some calories -rhubarb doughnuts with custard and nut brittle, which was outstanding. I really admire the way that the Edinburgh Larder focuses on high-quality Scottish suppliers – the food is proper bistro food – simple and unpretentious and I’d thoroughly recommend it. I wish it wasn’t in the basement though – on a summer evening, it’s good to get some daylight. This blog is mostly reviews of restaurants in Edinburgh and elsewhere in Scotland but I also include some personal thoughts on foodie things and, occasionally, reviews of restaurants outside of Scotland. I’ve been interested in food since I was a student in St Andrews many years ago and discovered that the only way to eat well was to learn to cook. I’m now interested in all aspects of food – growing, cooking and eating.